Before Sunday’s game, the Cardinals knew that their best hope to defeat the Eagles was to unleash wide receiver and Philly killer Larry Fitzgerald against the Eagles defense. Instead, it was the Cardinals who witnessed their own “House of Horrors” at the Linc on Sunday afternoon. And while there was no Jason, Michael Myers, or Freddy Krueger to do the heavy slashing like in those classic horror movies, there was Carson Wentz slashing through the Cardinals defense and slowly killing off any hope the team from Arizona had of making a comeback. By the time the 1st quarter was over and the last tailgater had settled comfortably into their seat, the score was already 21-0 and the Redbirds must have felt like they were living their own version of “Nightmare on Elm Street”. 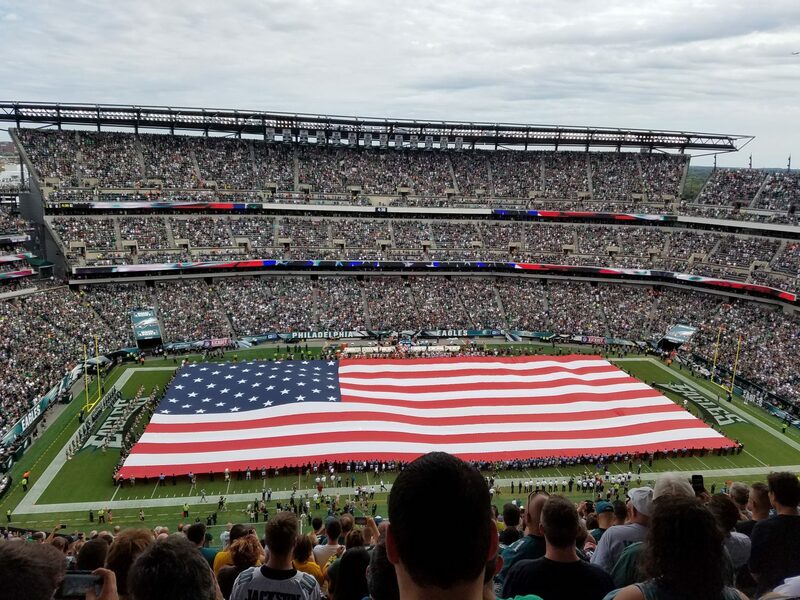 Meanwhile, Eagles fans, on what was an overcast but very humid day for early October, were enjoying all the pomp and circumstance of a blowout victory and happily singing along to all of Tom Petty’s greatest hits during the TV timeouts. One can only assume that whomever is responsible for the music at the Linc must be a huge Tom Petty fan. Meanwhile, Carson Wentz threw four touchdowns for the first time in his young career, as he spread the touchdown wealth to four different recipients (tight ends Trey Burton & Zach Ertz and wide receivers Torrey Smith & Nelson Agholor). Agholor’s touchdown reception was a sight of beauty, not only for the catch itself, but for the move he put on Cardinals safety Budda Baker. Speaking of Wentz, the 2nd year quarterback hails from North Dakota, a state that has neither 1) An NFL team within its borders nor a 2) Division I FBS School. As such, the heart and soul of football in North Dakota are the North Dakota State Bison, a Division I FCS school (the former Division 1-AA) and the school that Wentz led to Football Championship Subdivision (FCS) titles in 2014-15 (the last one being the team’s 5th straight championship). When the Birds drafted the North Dakotan as the #2 overall pick, they were looking for someone who could lead this team for years to come and possibly be the missing link to a parade down Broad Street. What they never expected was that, along with a quarterback, they acquired a whole state of new fans in the process. And while many North Dakotans, understandably, may not have known much about the City of Brotherly Love before 2016, they are fully behind their “native son” and have adapted this team as their own. Whether it’s a home game at the Linc or a road game in Kansas City, one can always find a North Dakota contingent of the “Wentz wagon” in the stands. And perhaps it will be some of that Bison green (their colors being green and yellow) that will help to eventually break the championship drought that has plagued this city for fifty-seven years and counting. The Birds currently sit at 4-1 and, along with their explosive offense, have a defense that has managed to play well even with all their injuries. Add to that the unexpected emergence of Kenjon Barner on special teams to replace the injured Darren Sproles, and you have the makings of what could be something special in 2017. Unfortunately, there is little time for this team to rejoice in Sunday’s victory, as a Thursday night contest on the road against the Carolina Panthers awaits them. The Panthers come in with a surprising 4-1 record as well, and this game could have HUGE implications for playoff seeding in January if both teams can continue their early season success going forward. One thing that could hurt the Birds is the loss of offensive lineman Lane Johnson, who may be out due to a possible concussion. But this team has managed to persevere thus far with injuries, especially on the defensive side.